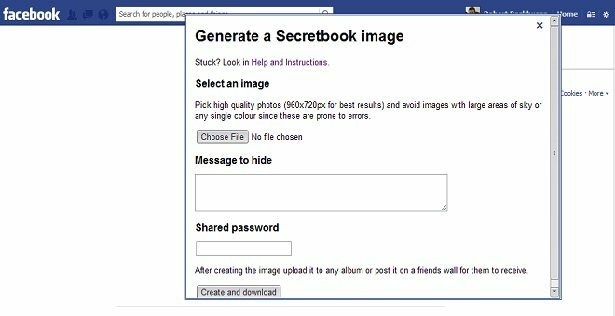 Secretbook, a new browser extension that allows you to encode secret messages into Facebook images will be released this week by 21 year old, former Google intern, Owen-Campbell Moore. With the extension, users will be allowed to share messages on images uploaded to Facebook without anyone, including the government or Facebook itself, seeing the messages unless they have access to a password. “The goal of this research was to demonstrate the JPEG steganography can be performed on social media where it has previously been impossible,” said Moore. The extension will only be available through the Google Chrome browser and took over a year to create. “Many tools for steganography in JPEGs have existed in the past although they have always required that the images are transmitted exactly as they are,” said Moore. The messages are restricted to 140 characters and when uploaded to Facebook the image is automatically recompressed, which can lower the image quality. To stop this, Moore replicated Facebook’s recompression algorithm. “This minimizes the amount of change it will undergo when they do recompress it, keeping the damage to the secret message low,” he said. “Conceptually, imagine storing the message ten times, each in different sections of the photo before it is uploaded and recompressed, the algorithm can then piece the original message back together correctly, despite each copy stored in the image being slightly damaged,” continued Moore. Secretbook is yet to be released and users will be able to access it from logging onto Facebook from the Google Chrome browser and pressing Ctrl-Alt-A.